A dietician and professional athlete’s love for fresh and healthy food has translated into a partnership that not only will feed the community with all kinds of naturally-grown produce, but also an education on what goes into the process. Starting next month, friends Pam Jones and Sarah Waybright will begin selling produce at the Middleburg Farmers Market—produce they have harvested on their Gathering Springs Farm four miles north of the town using an intensive growing system with techniques like flame weeding and regenerative soil management. The duo will bring arugula, spinach, radishes, beats, scallions and assorted Asian greens like bok choy to the market in their first few visits before replanting a variety of other produce in their no-till growing beds. The friends also plan connect with the community by hosting educational workshops on farming. The road that led them to this point began years ago, when Waybright, also a registered dietician, and Jones, a two-time Paralympic gold medalist who is unable to bend her right wrist, separately resolved to put healthy eating front and center in their lives. 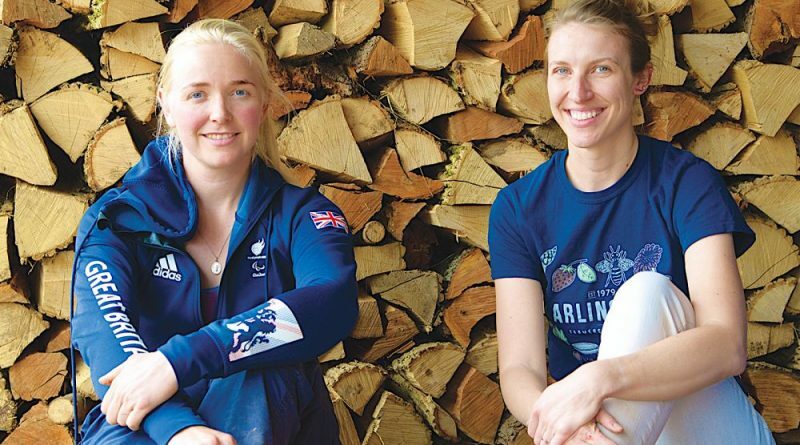 After winning the gold medal for rowing while representing Great Britain in the London 2012 and Rio 2016 Paralympic games, Jones, 29, moved to Virginia to be with her American Paralympic rower husband and start work at Potomac Vegetable Farms in Vienna. There she met Waybright, 35, who had been working there for a year and was already involved with her own business, Why Food Works—a website that aims to help people better understand the ins and outs of personalized healthy eating. Waybright’s passion for nutrition melded with Jones’ desire to farm and achieve self-sufficiency when they attended the Food Tank Summitin Washington, DC last March. Jones said they hatched the idea to start a farm after several people asked if they had already done so. “It just seemed like a no-brainer,” she said. 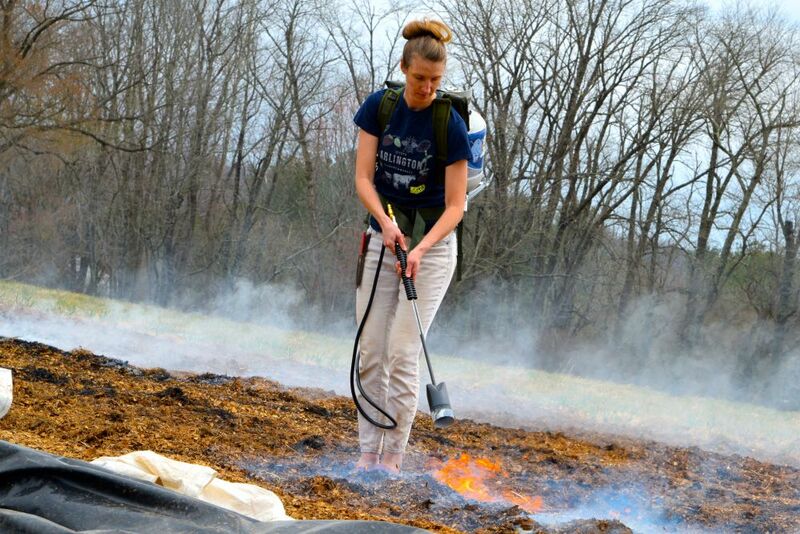 Sarah Waybright uses a homemade propane torch to flame weed a row of soil to prepare for Gathering Springs Farm’s first round of planting. A few months later, they were planting their first string of produce on land that the Tunnel to Towers Foundation gave to Jones and her husband, a Marine veteran who lost both his legs in combat. Gathering Springs—a name that uses “gathering” in a way to denote food collection and communal oneness and “springs” to symbolize the emergence of life through food and the existence of a spring-fed pond on the property—now grows produce with organic farming methods, although the duo doesn’t plan to seek USDA organic certification. The farm also emphasizes a no-till farming method with constantly rotating growing beds, a pest management system that employs the use of insects and compost- and wood chip-fertilization methods that keep the soil rich with nutrients. Those methods, which center on the duo’s philosophy to “gather and grow,” are being put to the test with the friends hard at work preparing for their first day of sales at the Middleburg Community Farmers Market on Saturday, May 4. 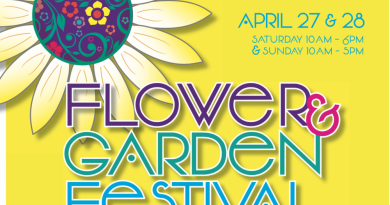 In addition to planting, they’re also planning classes to offer the public. Those include instruction on composting, soil health, container growing for residents to learn how to grow produce in their backyards, natural tie-dyeing using dye made from the farm’s food, yoga classes that feature a farm-to-table lunch and other courses geared toward crafts and food making. “I really want them to leave with an improved sense of the environment and health aspects of what our food system should be,” Waybright said. They eventually want to sell produce to local restaurants, set up a Community Supported Agriculture program that will allow customers to pay for their vegetables for the season but have the option to choose which ones they want at pickup times and accept customers’ table scraps to use as fertilizer for their crops, which could give customers a discount on their produce. “People don’t need to grow food to be involved in the food system,” Jones said. In the long-term, Jones and Waybright want to sell other food like eggs, berries and herbs, expand their growing area from 0.75 acres to 3 acres, bring in free ranging chickens to roam the property’s 13 acres, sell at different farmers’ markets, host events and possibly set up a co-farming program for other local farmers who don’t need much growing space to rent a portion of the land to do so. “It’s definitely something that can be done,” Jones said. Jones and Waybright are looking to hold an open farm day in late June or early July for guests to take a tour of the property and participate in activities. Guests will have the chance to see how the duo intends to implement their vision to “gather and grow” into reality. “That’s probably what’s driving us forward,” Jones said. 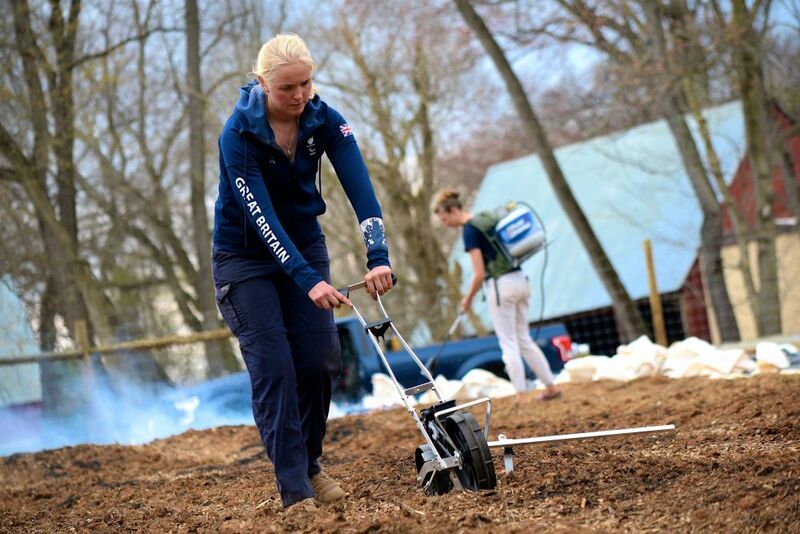 Pam Jones plants a first round of seeds as Sarah Waybright works to flame weed an adjacent row of soil on their Gathering Springs Farm near Middleburg. Awesome! A great addition to Loudoun’s direct market ag community! Best of luck you guys!